Poor Bessie! The life of a cow isn’t all that exciting, despite what those commercials for California cheese say (check them out on YouTube for a bit of a laugh). For August and September, we’re going to try and focus on going meatless once in awhile, and trying to eat more fish. If you take a look through my archives, you’ll see I actually did a Vegetarian Week (September 8-11) with some information on the “Meatless Monday” movement on September 11th (click here to see it). 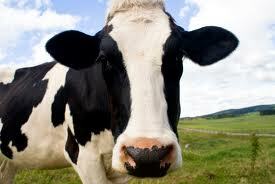 Changing up your meal variety is important though, and taking a break from red meats is definitely a healthy choice. Try instead going for fish instead, with it’s lean protein and omega-3 fatty acids. In a 3oz. serving of fish, you get 22 grams of protein from Tuna, Salmon, Halibut or Snapper. Eggs will give you 6 grams of protein in one large sized egg. On the vegetable/grain side of things, a 3oz. slice of Tofu will give you 6 grams of protein, while a cup of Edamame will give you a whopping 29 grams! A cup of Kidney or White Beans will give you 17 grams each. Nuts and Seeds will give you on average 9 grams per ounce for Pumpkin/Squash Seeds, and 6-7 grams per ounce for Peanuts, Almonds and Pistachios. Today’s recipe calls for grilling some Salmon, a good heart-healthy choice, both in the the protein and cooking method. For those of you who have concerns regarding the mercury level in fish, studies have shown that the positive health benefits of eating this protein out-weigh the potential harmful ones. You should always eat smart though, in addition to healthy. Check with your local fish monger which fish is freshest, where it was sourced, and make sure that it is sustainable. It doesn’t do us any good to eat healthy now, if there is no healthy world for our children to grow up in. Try and go meatless one day a week for all three meals, or at least try doing one breakfast, lunch and dinner at some point through the week that is meat-free! September – Eat More Fish! Make seafood the centerpiece of two meals a week. There are so many wonderful choices out there! Get to know your local fish monger! Tune back in tomorrow, to see how the healthy habits wrap up for the year! This recipe calls for using a grill. If you do not have one, or wish to not grill the fish altogether, you can prepare it either in the oven under the broiler for 5-10 minutes, depending on the thickness of your fillet, or you can pan sear it instead. This recipe makes 6 servings. Prepare the grill for high heat by lightly oiling the grill grate, either with some of the olive oil or with a non-stick cooking spray. Note: if you are using a spray, DO NOT spray over a lit grill. This is a good way to lose your eyebrows. 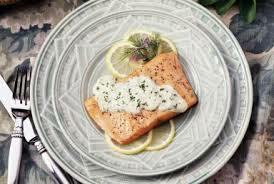 Season the salmon fillets with salt and pepper and drizzle with 3 tablespoons of the olive oil. Cook the salmon on the grill until the fish flakes easily with a fork, 5 to 10 minutes. Meanwhile, while the salmon is cooking, in a small bowl, whisk together the mayonnaise, mustard, remaining olive oil, garlic, lemon juice and zest, dill, salt and pepper. Set the sauce aside until the salmon has finished cooking. When the salmon is done, place it on a serving plate and top with the prepared sauce. This dish can be served hot, cold or room temperature. * To learn how to properly clean fresh dill, click here. ᶲ For tips on zesting and juicing a lemon, click here.